May 11, 2014, was Mother’s Day, a day of celebration for the Northrop family. Jessica and Mike Northrop and their two children—daughter Presley, who was then 3 years old, and baby Jaxon, who was 9 months old at the time— were having a barbecue with several other relatives at the home of Mike’s parents, who lived next door in Concord. In the blink of an eye, celebration turned into panic. Father Mike started CPR (cardiopulmonary resuscitation). Paramedics arrived within minutes and transported Jaxon to a hospital in Concord. From there he was transferred to the intensive care unit at Kaiser Permanente’s Oakland Medical Center, where he spent five days. 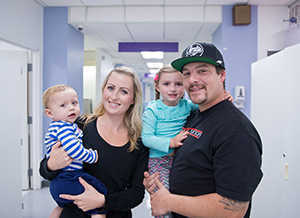 With his medical condition somewhat stabilized, Jaxon was transported to the inpatient Rehabilitation Medicine unit at UCSF Benioff Children’s Hospital Oakland, where he would spend the next three months. The Rehabilitation Medicine team tried various medications for Jaxon, hoping to at least allow him to sleep. That stage took two to three weeks to improve. Jaxon began a regular regimen of rehabilitation therapy, with 45-minute physical and occupational therapy sessions twice a day on Mondays, Tuesdays, Wednesdays, and Fridays, and once a day on Thursdays and Saturdays. He also had speech therapy sessions three times a week, as well as music therapy, usually twice a week. In addition to the work of physicians, therapists, and nurses, Children’s provided the Northrop family with services to help them through their long ordeal, beginning even before he was transferred to Children’s from Kaiser in Oakland. Another factor that helped make the family’s time at Children’s more comfortable was Child Life Services, a program that helps young patients and their siblings understand and adapt to the hospital experience. By August 14, Jaxon was able to return home. Social Worker Barouch had provided the family with contact information for behavioral health services at Kaiser Permanente (the family’s regular health care provider), as well as referrals to a family resource network and the Regional Center of the East Bay, which has programs for developmentally disabled children. Pediatric Rehabilitation Case Manager Kimberly Specht arranged for outpatient physical therapy at California Children’s Services. She also coordinated efforts with Kaiser Permanente regarding Jaxon’s equipment and supply needs and his follow-up appointments. Since returning home, Jaxon has continued to make progress. “It is really fun to watch him grow and develop,” says Jessica. “He reaches out for his toys, brings his spoon to his mouth, and gets up on his knees and tries to crawl. He’s trying hard to say ‘hi,’ and to wave. I don’t always recognize the day-to-day progress, but when the therapists haven’t seen him for a few days or a week, they’re excited about the progress. I didn’t even know if Jaxon would make it, so every little step forward was amazing. I think it’s magic what they can do.